Luke looked with new eyes at the group sitting in front of him in the dark woods. They must all be illegal third children using forth identities. Luke’s heart gave a jump. AT last, he’d found others like him. He’d found a place to belong. This series first captured my interest when I was thirteen. Six years later I still occasionally return to them as comfort reads. It’s rare to find books that were age appropriate as a tween an early teen that remain interesting years later. 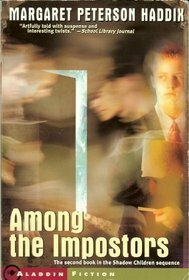 Among the Impostors follows twelve year old Luke Garner, an illegal third child. After his only friend, another third child, dies, Luke is separated from his family and taken to hide in a boys school. There he meets other third children…but he’s not sure all of them are what they seem to be. Can he discern friend from foe before the population police find him? I agree! But only if they do they the movies right. If they planned to change the books around, they shouldn’t bother.